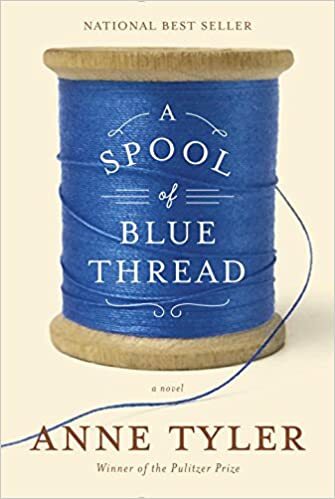 A Spool of Blue Thread is the first novel by Anne Tyler that I’ve actually read. Like others, I saw the film adaptation of The Accidental Tourist, which I thoroughly enjoyed, although the story wasn’t the kind I’d normally read. I found it closer to popular fiction than literature. However, Tyler has been compared to other revered American writers, such as Eudora Welty and John Updike. Tyler also won the Pulitzer Prize for Breathing Lessons in 1989. I remember how a smart colleague of mine raved about it at the time. Still, I’m not entirely sure why A Spool of Blue Thread was shortlisted for the Man Booker Prize last year. I suspect that it was because American authors have only recently become eligible for the prize and that her nomination was influenced by her earlier work. In a recent interview with the BBC, Tyler, who was born in 1941, suggested she may not live to complete another novel although she is scheduled to write an updated version of Shakespeare’s Taming of the Shrew. If she hadn’t, you’d have led a very different life, believe me. You’d have been shunted around who knows where, rootless, homeless, stuck in foster care someplace, and you’d probably have turned into one of those misfit guys who have trouble keeping a job, or staying married, or hanging on to their friends. You’d have felt out of place wherever you went; there’d be nowhere you belonged. Of course, Denny ends up describing himself. While the other children thought their mother showered attention on their biological brother, Denny felt neglected, the odd man out, the misfit. Abby and Denny’s stories remind us that the best of intentions can produce unwanted effects. This seems to be the theme of the novel — that problem children are not necessarily the result of bad parenting but the manifestation of unforeseen consequences, yet another example of life’s not so little ironies.